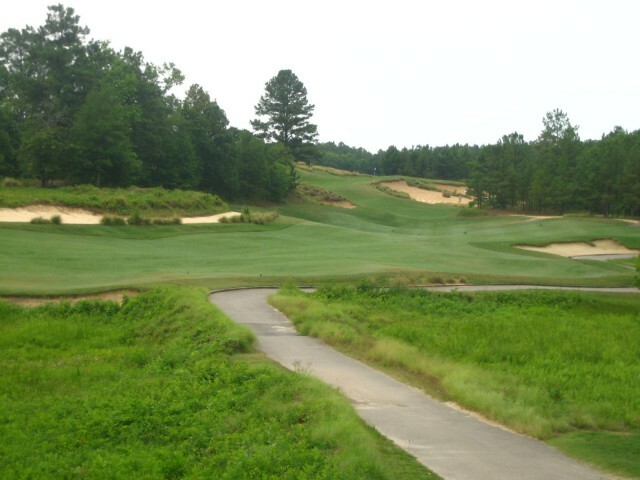 Tobacco Road’s 9th hole shows how Mike Strantz staggered and stretched features across a beautiful golf site. 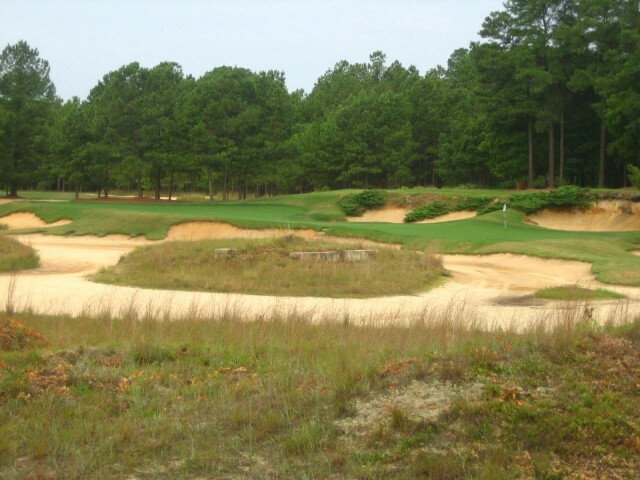 The opening tee shot at Tobacco Road is played through a gap between two steep grass-covered dunes to a partially obscured fairway. 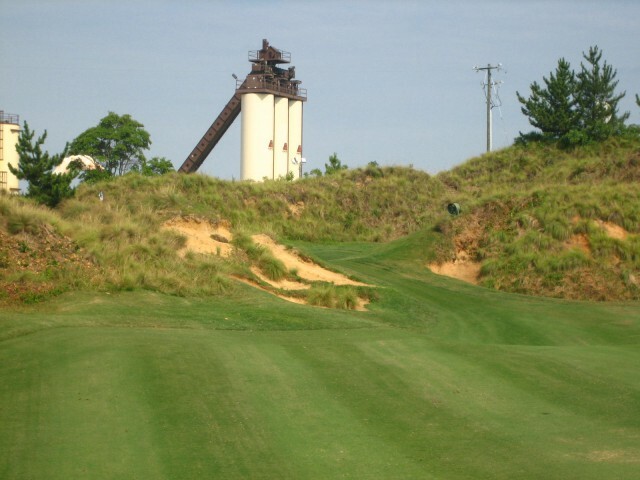 If played from the correct tees, getting the drive over and past the dunes isn’t difficult. But the fact that these battlements are there at all is a signal that this is not going to be a typical round, and this is not a typical golf course — at least by American standards. 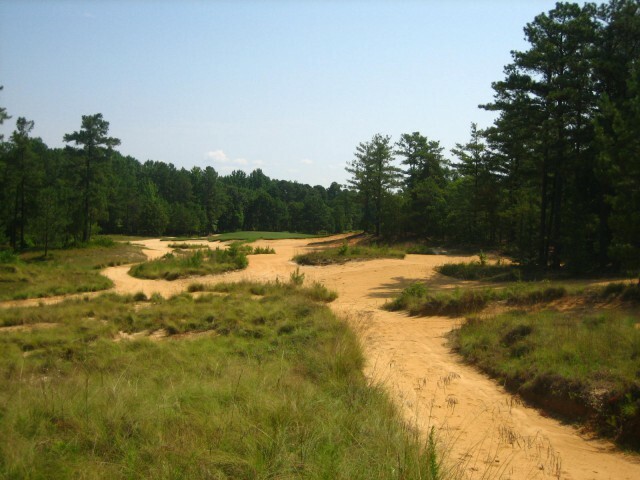 More than simply obstacles to outmaneuver, the dunes are a portal, a gateway that divides two golf worlds: this, the ordinary one, and the other, Tobacco Road. Step inside, they seem to beckon, and prepare for what lies beyond. These two large dunes act as a portal to the world of Tobacco Road. Whether players enjoy the “beyond” of Tobacco Road or view it as an inferno of abandoned hope likely depends on whether the drive on this mysterious par-5 feels exhilarating or maddening. Both camps claim plenty of souls. There are few places in U.S. golf as polarizing as Tobacco Road, about halfway between Pinehurst and Raleigh, because there are few that are anything like it. The course sits alone in a rural wooded area that touches parts of an old quarry and sports superior natural golf amenities like sandy soil, dense landscapes of pine, several creek crossings, ridges and gentle tilts of land. 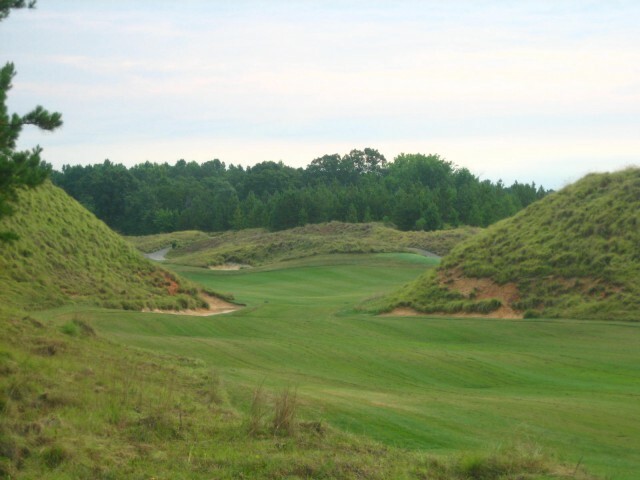 These features — along with those created by architect Mike Strantz, like those opening dunes and large sand caverns and washes — confront the player on nearly every shot, forcing you to constantly assess line, distance and risk. But lots of courses do that. 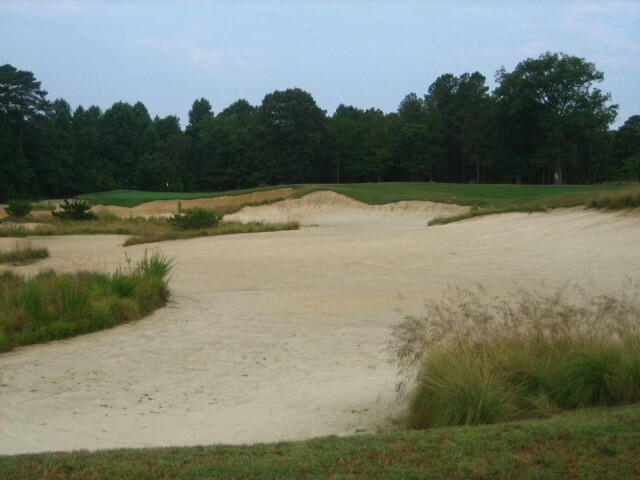 What really sets Tobacco Road apart–and what puts certain golfers off–is the relentlessness of these decisions and the equally relentless severity of unconventional shapes in the fairways, bunkers and greens. The par-3 6th is only 107 to 148 yards to a wide, shallow green. Yes, that’s all one green. It can be mentally and visually disorienting. Strantz’s landforms (he passed away in 2005) confuse depth perception and juxtapose natural ingredients in ways that are as jarring and surreal as they are aesthetically stimulating. Fairways appear, bubble and vanish. The greens seem to expand and creep like elongated forms of Silly Putty. The acres of scrub and washouts seem cruel and unusual if you lose your gamble and find your ball in one. These holes get in your face and in your head. It’s also one of a handful of American courses where’s it’s almost impossible to take a poor photograph. A silly putty green at the par-3 8th. After getting past the high dunes with your drive at the 1st you’re faced with another semi-blind shot between another, smaller gateway of dunes. The third shot, if not played far to the left, must carry over another high bunker complex short-right of the green. That’s correct — three blind or semi-blind shots on one hole. Often lost in the admiration/bewilderment of the visuals Strantz created is respect for the shot opportunities and options Tobacco Road invites. 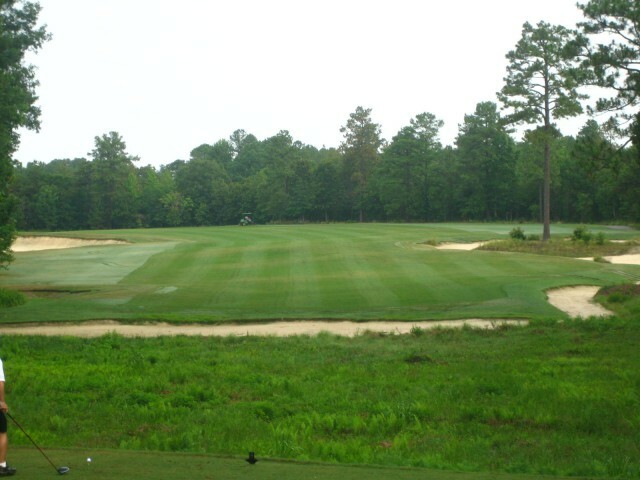 The fairways are uncommonly wide and often bend sharply around bunkers and blowouts. On any given hole there are numerous ways to plot your ball to the green. Stellar holes like the par-5 4th, the short par-4 5th, or the tantalizing par-5 11th, all which button-hook around large centralized hazards, tempt you to play straight for the green in one or two shots but also allow all the room you want to take the long road around. …which leads to this decision: where do you place your second shot? The first five holes are about as gripping an opening run of golf as you’re going to get in the southeast. The group of par-5’s are as interesting and fun as you’re going to find anywhere, period. 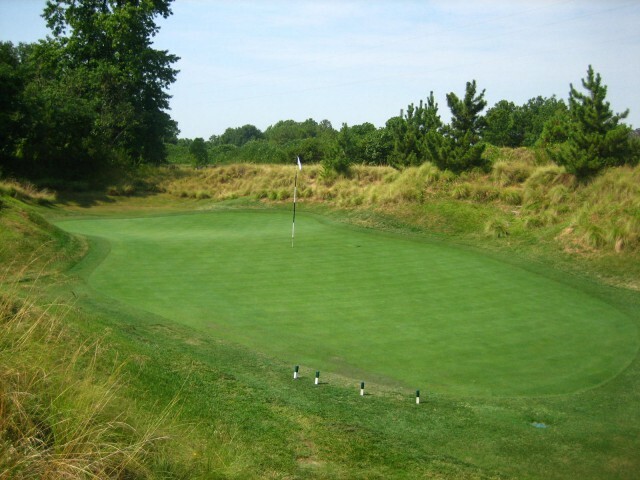 The reverse-S 13th is a particularly fascinating study, a three-part play featuring a blind second shot over a corner of trees and a tiny green nestled into a dell surrounded by dunes. And the par-4 18th, over a dune, then uphill and left into a saddle, could be a template for the great first hole at Bandon Trails. The third shot at the par-5 13th. 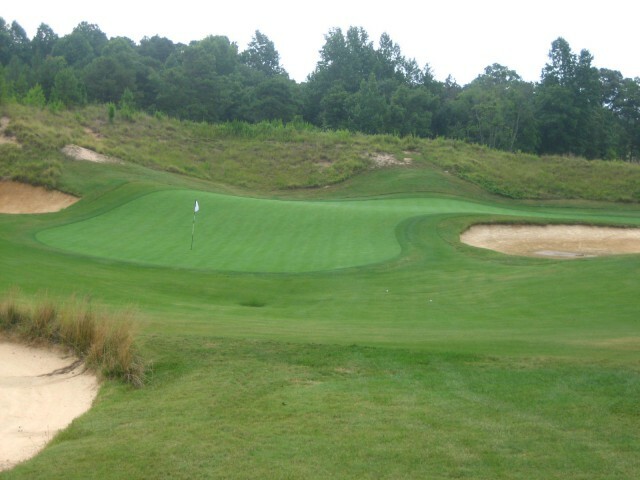 Notice the top of the flagstick over the dune on the left. The secluded dell green at the 13th. Not everything is a total success. At less than 6,600 yards, elite players may feel bottled up. Some of the greens are too small or too narrow for the shots being played into them (the uphill 9th; the par-3 14th). The wide shallow green at the par-3 6th fits the hole perfectly, but a similar green at the short, downhill 17th is redundant and unpleasantly naked. And the blind, 90-degree, uphill 16th would get tiresome if you had to play it too often.